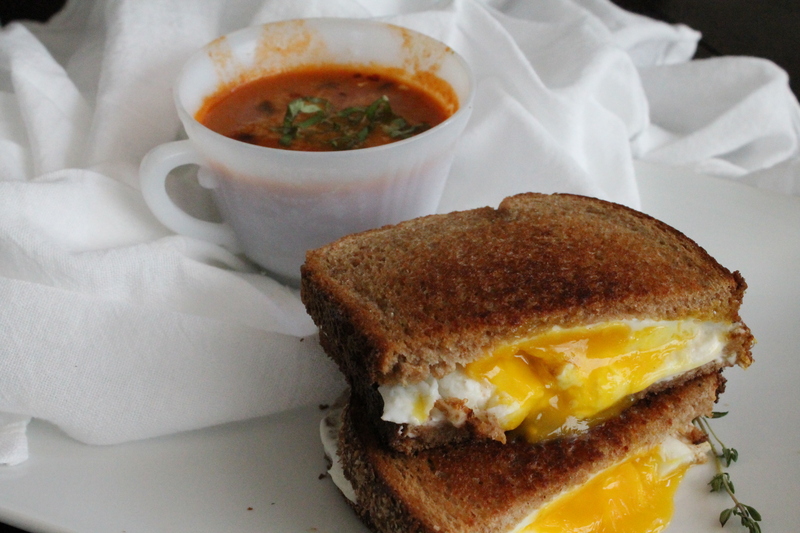 It’s a snow day, so you know what’s on the menu at my house: grilled cheese and tomato soup. It’s the perfect comfort food! I have so many memories of eating this meal as a child, especially after traipsing around in the snow on a winter day. My mother would stand at the stove and stir milk into the Campbells condensed tomato soup, expertly flipping buttery cheese sandwiches on the griddle. She had a special mug that was just for her tomato soup—because tomato soup should always be served in a mug. We would sit at our old Formica table, slurping our soup and dipping our melty sandwiches, getting warm enough to go out for another round of sledding down the giant hill in front of our house. But, of course, I have grown up a little. And as much as I still love the classic grilled cheese and tomato soup of my childhood, I also like to let my comfort foods grow a little. And seriously, I dare you to find anything more delicious than goat cheese, nutmeg, fresh thyme, runny egg yolks, and balsamic vinegar. I dare you! This grown-up version of a favorite comfort food is just stunningly delicious. Thank you, snow days, for being so yummy. 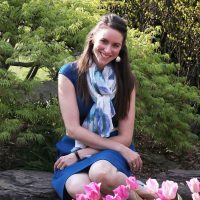 First off, I am going to be straight with you: I am a busy mom, and sometimes a lazy cook. I have definitely made a simple and much quicker version of this meal by starting with Progresso Tomato Basil soup and adding balsamic to cut the canned sweetness and crushed red pepper for a little kick. Sometimes easier is better. If you have some tomato basil soup on hand, I totally encourage you to take a shortcut! Snow days are better when you are relaxing, right? But if you want to make this soup from scratch with me, that will be awesome, too! And, although it takes a while, most of the time is just letting the soup simmer. Start by dicing two cooking onions. 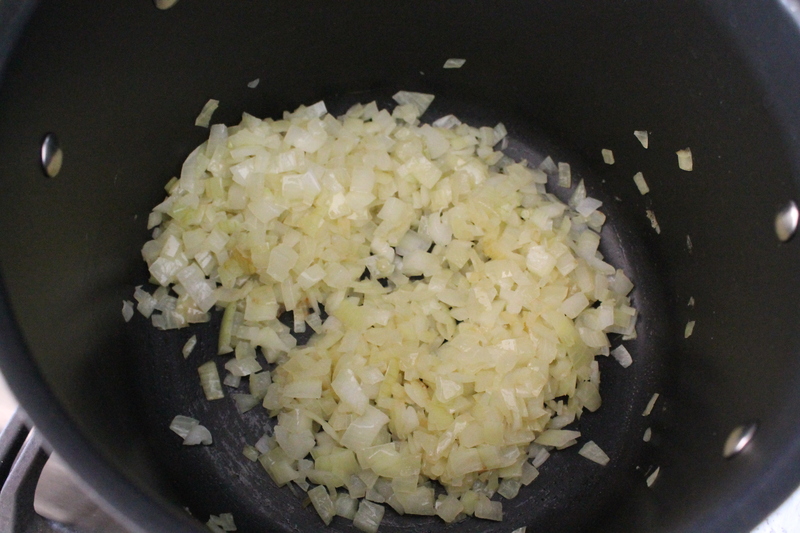 Heat some olive oil (or unsalted butter, yum) in a large stock pot or Dutch oven, then add the diced onions. Cook over medium heat, stirring occasionally, until the onions begin to brown. Add garlic (the more the merrier, really) and cook 1 minute more. 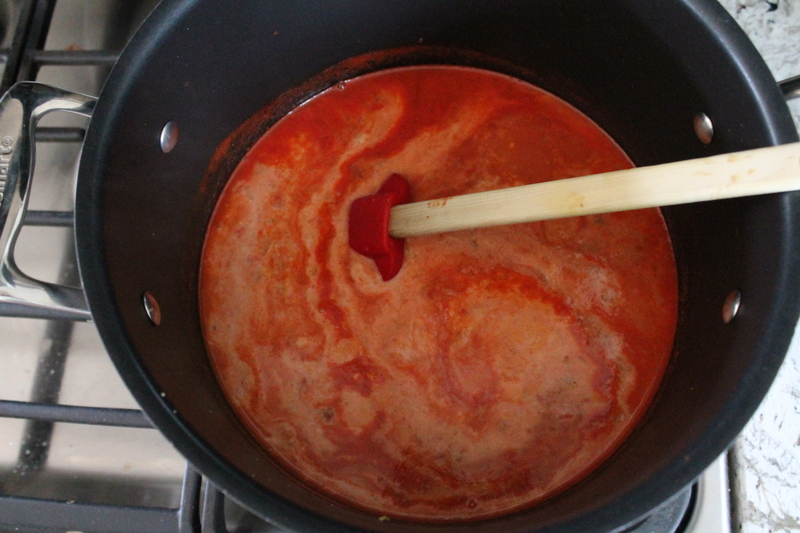 Stir in the crushed tomatoes and stock. Season with more salt (go cautiously if you did not use a low-sodium stock), black pepper, and crushed red. I really think the kick of the crushed red pepper takes the whole flavor up a level, but you could dial it back if you are spice-shy. Let the soup simmer at least 15 minutes. It won’t hurt it any to go longer, but if you are hungry, 15 minutes will do! Add cream, fresh basil, and balsamic vinegar. Seriously. You must add vinegar. The sharp tang of balsamic vinegar is delicious with tomatoes, and it really makes the classic soup taste grown up! Simmer another 5 minutes, then blend the soup. I used an immersion blender, which is really easy and mostly mess-free, but you could also pour the soup into a regular blender and puree it that way! Return the soup to the heat. Add fresh grated parmesan cheese, then taste for seasonings. Let the soup sit over low heat, stirring occasionally, while you make the grilled cheese! Mash together the goat cheese (YUM! ), cream cheese, nutmeg, fresh thyme, and a pinch of crushed red. You could even add a dash of garlic powder if you are in the mood. I admit that most of the time, I just eyeball the ingredients and then taste to make sure the combination is delicious. 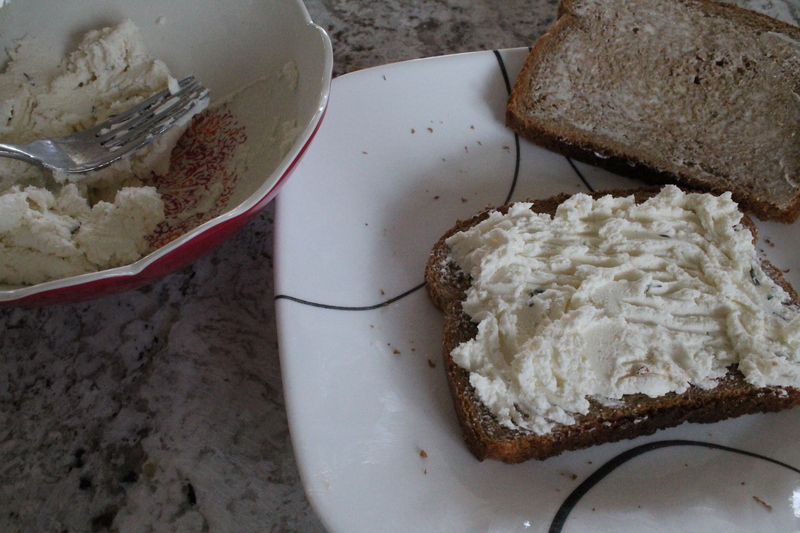 Sometimes I may end up with more goat cheese, sometimes I may end up with more thyme…but it is all yummy! Butter as many slices of sandwich bread as needed. Spread the cheese on the un-buttered sides of half of the bread slices. Time to fry eggs! I like to use little metal circles so the eggs stay nice and neat and fry well. Keep the heat at medium, enough to sizzle a little butter before you crack the egg into the pan, but not enough that the yolk cooks through quickly. And plan to undercook the eggs a little: don’t forget that it’s going to cook more inside the sandwich! Carefully transfer the fried eggs to the sandwiches. Top with the remaining bread, buttered side out of course. And grill the sandwiches! Go for a slow cook over medium-low heat, turning the sandwich a few times to get that golden caramel color on the bread. The cheese will expand slightly and turn so smooth and silky, the egg will cook just enough that the white is firm but the yolk still runs. Ahh, perfection! Meanwhile, serve the soup into bowls. Garnish as you like! I always add a little extra balsamic and red pepper, and parmesan and basil are also quite nice. Cut the sandwiches in half and serve alongside the warm soup. Snow day complete. Begin with the soup. Heat the oil in a large stock pot over medium heat. When hot, add the onions and season with about ½ tsp. kosher salt. Cook for 10–15 minutes, until they begin to caramelize. Add the garlic and cook 1 minute more. 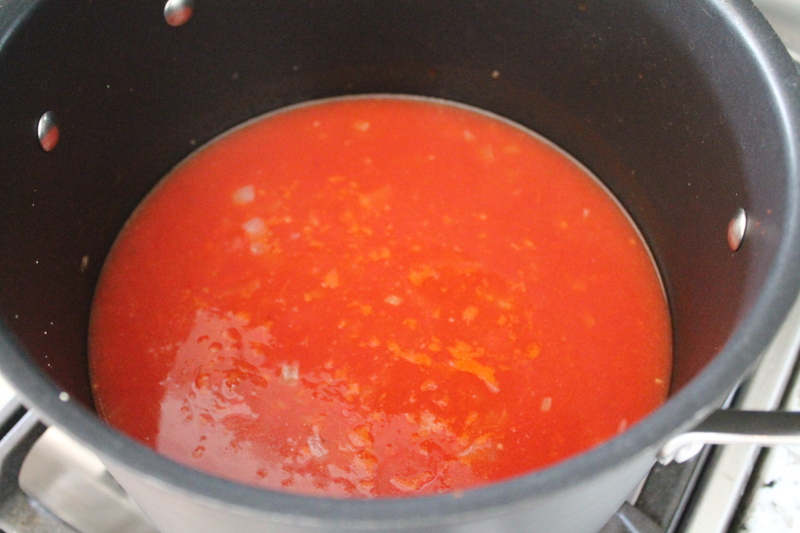 Pour the tomatoes and stock into the pot and season with salt, black pepper, and crushed red pepper. Stir to combine. Bring the soup up to a boil, then simmer for at least 15 minutes. Add in the balsamic vinegar, cream, and basil. Cook another 5 minutes, then puree thoroughly with an immersion blender. 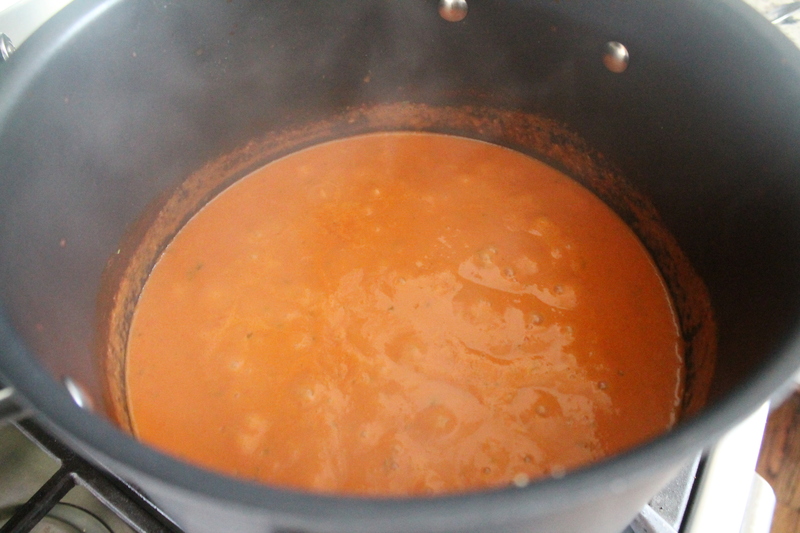 Continue cooking the soup another 10–20 minutes, until it thickens slightly and the flavors brighten. Stir in the parmesan. Taste and adjust seasonings as needed. Remove the soup from heat and allow the soup to cool 5–10 minutes before serving. Garnish with extra red pepper, parmesan, and basil. Meanwhile, spread the bread slices with ½ tbsp. butter each. 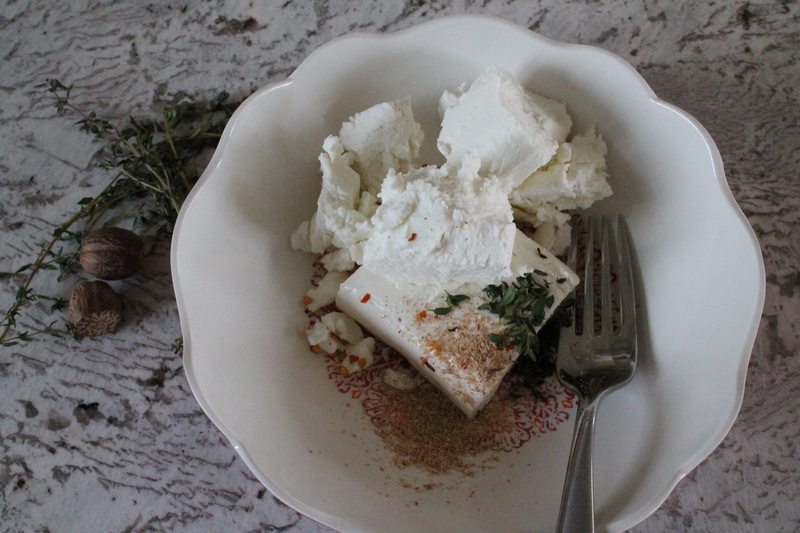 Stir together the goat cheese, cream cheese, thyme, nutmeg, and crushed red pepper. Divide the cheese mixture evenly on the un-buttered sides of 4 slices of bread. Heat the remaining butter in a large pan. 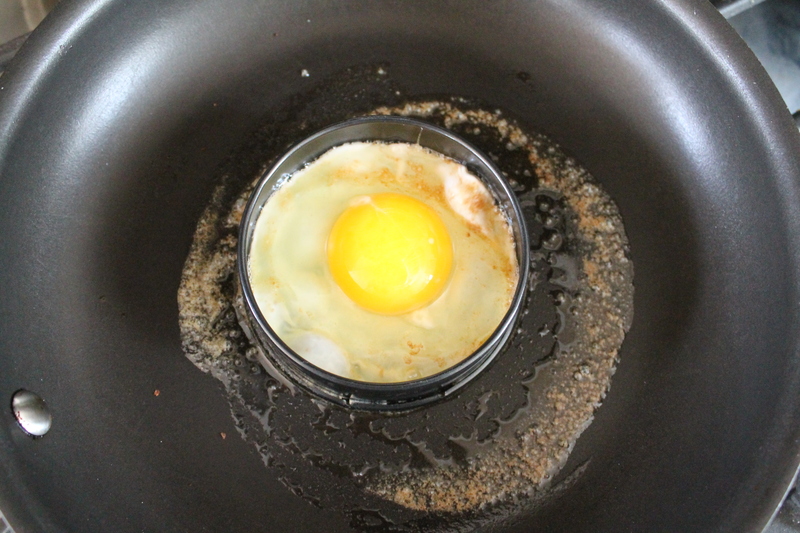 Fry the eggs over easy or sunny-side up, making sure the yolks stay runny. Carefully slide the eggs out of the pan and onto the waiting cheesy bread. Top each sandwich with the remaining buttered bread slices. 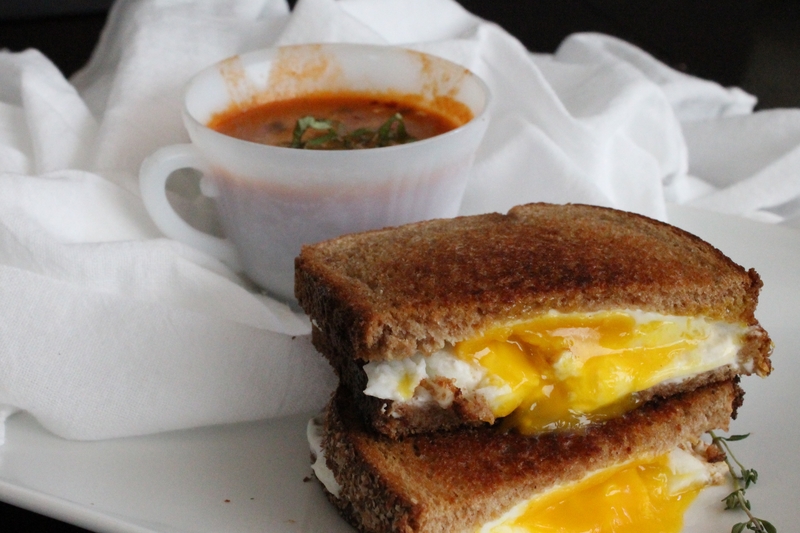 Grill the sandwiches to a golden brown, keeping the heat low enough that the egg yolks don’t cook through completely. Serve the sandwiches hot with warm tomato soup. 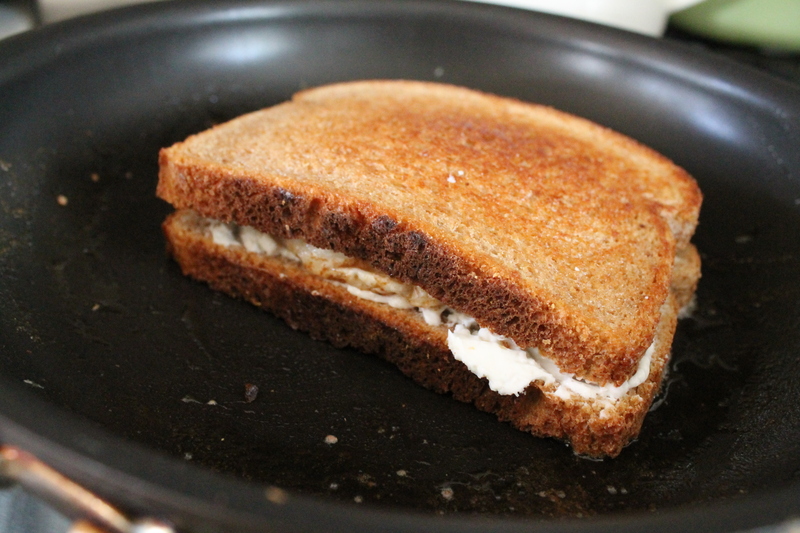 I think I might actually be craving some grilled cheese right now….. Off to the refrigerator!!!! !